29 Old Stone Bridge Road, which was first listed at $1.950 million in March, 2017, had "a price improvement" today, down to $1.650. I have a client interested in the development, or at least willing to consider it, so the price cut caught my attention. But reviewing it, I realized it's still the non-starter it was last year. There's just too much to undo here to make it work, even at its new price. Of course, that's just my personal opinion: someone else may love it exactly the way it is, in which case, $1.650 isn't a terrible price. 124 Pecksland Road, which sold for full price: $3.495 million after just 24 days on the market back in 2006, finally reports a contingent contract. "Renovated" (new roof, copper gutters and kitchen appliances) in early 2015, it's been on the market since December of that year and now, 783 days later, after dropping its price down to $2.449, seems to have found a buyer. Have Greenwich house prices recovered from the 2008 bust? In some cases, yes, but not all houses, even in the more popular neighborhoods of Old Greenwich and Riverside. Case in point: 7 Binney Lane, Old Greenwich. Purchased new in 2007, the last gasp of the boom, for $4.950 million. After extensive, and expensive, add-ons and improvements, including a pool, it was placed back on the market in 2009 at $5.995, but finally sold for $3.925 in 2013 (it was rented out for some of those years). This time around, it was put on last November at $4.250, and reduced today to $3.995. Even assuming it sells at that price, soon, it's at best holding steady at its post-bust price, five years after its last sale. That's better than losing money (although it hasn't sold yet, so let's reserve judgment), but it does put paid to the fantasy that buying a depreciating asset is an "investment". Moral: buy a house to shelter your family in whatever comfort you choose to pay for, but don't expect it to fund your retirement. 432 Field Point Road, known as "The Boulders" for some reason, dropped its price today from $5.199 million to $4.990 . I understand the owners' reluctance to budge on price, but they put this property up for sale in 2013 at $5.995 million, and if it hasn't sold in five years, a more substantial price cut may be called for. 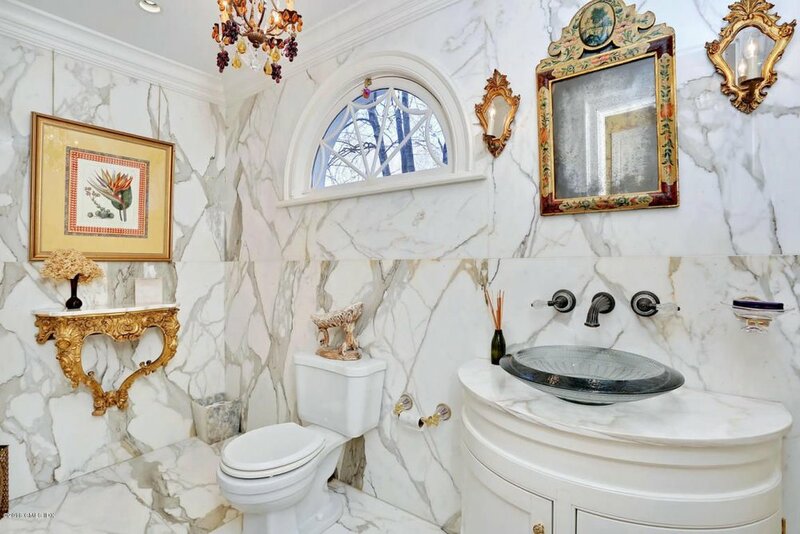 When Ogilvy (of course) represented the previous owners, he priced it at $8.5 in 2003, and finally sold it in 2006 for $4.3 million (I used to get calls from the owner from time to time, asking me why her house wasn't selling. She finally got the message, but stayed loyal to David til the end, nor did I encourage her to leave him — I don't operate the way). It was, and remains, a lovely house inside, but I think the stone exterior put off a number of buyers. That, its price, and the ancient mechanicals. These owners didn't change that exterior, but put an extraordinary amount of money into modernizing it inside, and building a two-car garage to replace the original car port — back in 1880, I doubt the owners gave much thought to garaging vehicles. Of the Belle Haven peninsula, but not in the association's boundaries. The original staircase, one of the most beautiful I've seen, remains, but the kitchen is new, walls have been moved, new mechanicals installed, and so forth. I'm doubtful that those changes amounted to the $1.7 million they added on to the price they paid for the house. Or maybe it did, which would explain the owners' refusal to cut its original 2013 price of $5.995 from 2013 to 2016; alternatively, I note that the seller is a real estate agent, and agents are notorious for overpricing their own houses. Still and all, if you can get past those rocks, and the nine bedrooms, a very nice home awaits you inside. 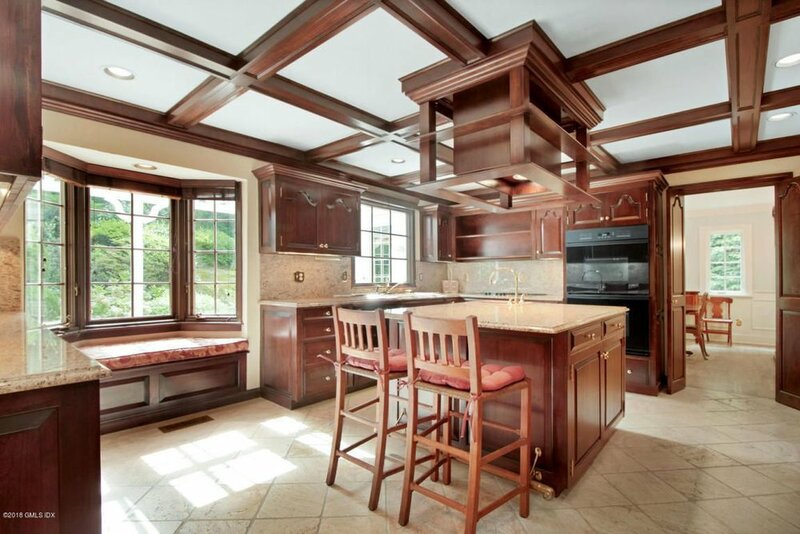 I was just reminded of the basic flaw of this house: it has a narrow, windowless galley kitchen, which probably worked fine when only servants labored there back at the turn of the last century, but not so popular now. I've seen some redo/fixes of this problem in other old homes — one in Rockwood comes to mind — but because of the stone construction of this house, I don't see how one could grab some of the space from the dining or family room without screwing up the windows in those rooms. Then again, I'm neither an architect nor a builder, so perhaps there is a solution. The fact that these owners spent so much money renovating the place but left the kitchen as is makes me suspect that there isn't. (But see architect Formerly 06820's thoughts in the comments section about demoing the mudroom etc. Might be possible, though if I were representing a buyer, I'd expect the price to reflect the cost of that renovation/addition). 21 Ann Street, asking $4.745. Not a crazy price for this neighborhood (and it's high enough to avoid flooding, unless Al Gore does a cannonball in the cove across the street). I'm a little surprised that it's sat on the market since September, 2016. 38 Dairy Road, most recently asking $5.495 million, is reported as "pending". I personally am not wild about this house at this price, but at least the price has improved since 2016, when it was put on the market at $7.250. Fire sale available on Byram Shore Road? 207 Byram shore road. "Hey, kids, let's put on a show!" 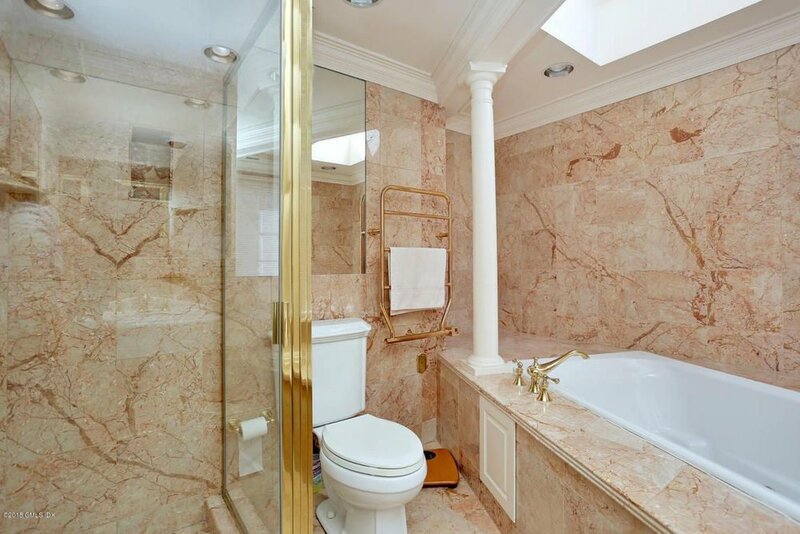 A reader has asked how much I think 207 Byram Shore Road, originally listed for $32 million in 2013 and now down to $19.750, might eventually sell for. That's hard to say, because while on the plus side it has direct waterfront, the downside is that it's owned by Harvey Weinstein's brother Bob, and in light of what's happened to the two brothers' film company, he might be willing to sell off cheap and focus on other things. Weinstein paid $16.4 million for the place in 1999, after it had been on the market for just 90 days (the same agent had both sides of the deal) and performed what the current listing describes as a "top to bottom museum quality renovation", so this shoreline property is already underwater at $20 million, but I'm guessing there's still room for it to sink further. Toss a lowball bid at it, is my suggestion, and see what you get. But no rush: at this point, it's obvious that both time and tide have waited for you. 52 W. Brother Drive, priced at $5.495 million a year ago February, is down to $4.195. MLK's birthday holiday usually marks the beginning of Greenwich's spring market, so the timing is propitious; if only the owners had been quicker to cut their price earlier, they'd probably be done with this house by now, and on to other things. That original price sat unchanged from February to September, when a $500,000 was taken. But well before September the owners should have realized that they'd overpriced their home. Then, after missing the spring market of 2017, they let the house sit through the entire fall market. Bad idea. But the house and its location are fabulous, and while I can't vouch for $4.195 being the right price, surely buyers who may have passed it by at those first two prices will want to give it another look. 180 Stanwich Road, last asking $2.195 million, reports a contract. I never quite understood why this house didn't move more quickly. It's an older home: 1928, and with just 3,000 square feet it's small by today's standards, but with 2-acres, there's plenty of room to expand. It sits far back from the road, giving it a nice presence, to my taste, and both the front and back yards are very nice. It was on the market for just 74 days in 2005, when these owners paid $2.6 for it but this time, returned to the market in April, 2014 at that same price, it took 1,211 and multiple price cuts to attract a buyer. No one ever said, I hope, that real estate is a liquid asset. $1,362,500, from an original June, 2017 asking price of $1.495 million. That's about in line with comparable sales on the street. Not exactly a house I'd be delighted to live in, but it's located at the northern end of the street, away from most of the ambulances arriving at the hospital, it's close to central Greenwich, and, for Greenwich, not a whole lot of money.